500,000+ 5 Star reviews. On all orders to the UK Mainland. Top brands at low prices. Range of tools including top brands. 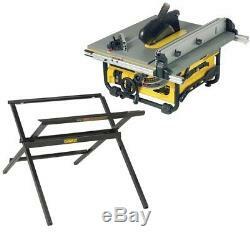 Dewalt DW745 Heavy Duty Lightweight Table Saw with DE7450 Leg Stand 240v. Black and Decker CS1835 13 Electric Chainsaw 35cm Bar Corded 1800w CS1835-GB. 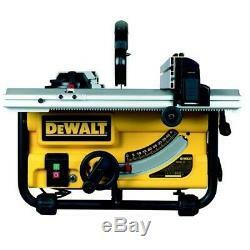 Dewalt DW745 Heavy Duty Lightweight Table Saw 240v with DE7450 Legs Stand Stock Code: DW745_240_DE7450 Features of the Dewalt DW745: The fence system on the DW745 table saw provides 610 mm of rip capacity in a portable design for cutting large sheet materials to size. The cast table top design ensures accuracy and precision, and the overload protection system ensures powerful performance in hard, wet or frozen woods. Also comes with a quick bevel lock with large scale for easy, accurate adjustments. Features of the Dewalt DE7450: The DeWalt DE7450 table saw stand delivers the best of both worlds: solid construction for a safe work environment and a compact, folding design for easy transport and storage. Featuring heavy-duty tube steel construction that can support the stress.. Features of the Dewalt DW745: The fence system on the DW745 table saw provides 610 mm of rip capacity in a portable design for cutting large sheet materials to size. Featuring heavy-duty tube steel construction that can support the stress of tough saw jobs, this stand is designed for use with the DeWalt DW745 table saw. Integrated support bar hardware holes make it easy to secure the saw to the stand for confident operation. Specifications of the Dewalt DW745: Power Input 1850 Watts Blade Speed 3800 rpm Blade Diameter 250 mm Blade Bore 30 mm Bevel Capacity -3 to 48 Max. Ripping Capacity [right] 610 mm Max. Ripping Capacity [left] 315 mm Max. Depth of Cut at 90 77 mm Max. Depth of Cut at 45 57 mm Table Size 630 x 570 mm Weight 22 kg Depth 742 mm Length 577 mm Height 425 mm Sound Power 109 dB(A) Sound Power Uncertainty 3 dB(A) Sound Pressure 96 dB(A) Sound Pressure Uncertainty 3 dB(A) Specifications of the Dewalt DE7450: Collapsable format and detachable legs for easy transportation. Detachable leg extensions for different saw heights. Our carriers apply a surcharge to certain UK Islands, Northern Ireland and the Scottish Islands, unfortunately we have to pass this charge on to our customers. Whilst we do not want to pass on surcharges to our customers we are unable to absorb the full cost of sending to these orders. The only exception to this are items that are delivered on a palletised service which will have to be booked in with a member of our Buyaparcel team. Any parcel being delivered by courier will require a signature on arrival. If you are not at home the driver will leave an information card. You can track the progress of your parcel by the Track My Order link at the top of the page. If your goods have been sent by a trackable service you will be able to track your order stage by stage using the couriers online tracking system. Buyaparcel UK Deliveries - Couriers. If the date and time is not convenient, you can simply either text back or reply back via the website to choose the next convenient date, leave in a safe place or leave with a neighbour. Please check the UKMAIL site for your closet depot. Details of these zones are below. Carriage charges for returning unwanted parcels or items ordered in error are at your expense, we cannot be held responsible for this. Please use a traceable service, otherwise there is a possibility the courier could misdeliver your goods and your parcel will not be relocated. We cannot be responsible for which courier you choose to return any items back with. It is highly important that you check your goods as soon as they are received. Damaged items delivered with Palletways must be noted when you sign for it and reported to us within 24 hours. It must be signed as either damaged or unchecked for the claim to hold. Return costs will only be covered if authorised by a member of the Buyaparcel team. Emailing us that you wish to cancel your order does NOT guarantee its cancellation. Only once the order has been confirmed as cancelled by a member of our team is this the case. Once an order is in the despatching process, we are then unable to cancel it. We do not take financial responsibility for the cost of the return of any products ordered in error or that are no longer wanted. If this is the case you will be contacted by the carrier advising how to arrange redelivery. Dewalt DHS780N XR 2 X 54v Flexvolt Cordless Brushless 305mm Mitre Saw - Bare. DeWalt DWE576K 240v Precision Circular Saw 190mm 1600w + Track Plunge Rail Base. Dewalt DT10300 Circular Saw Blade 165 x 20mm x 24 Tooth Extreme Framing DWE550. 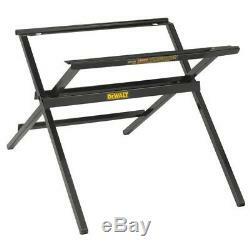 Dewalt DE7033 Heavy Duty Short Beam Mitre Saw Leg Stands Workstation DW717 DW718. Dewalt DCS380D1 18v XR Reciprocating Sabre Saw Li-ion + 1 x 2.0ah, Charger + Bag. Dewalt DCS365N 18v Cordless XPS 184mm Mitre Saw Bare Unit + DE7033 Leg Stand. 2X Dewalt DE7035 Heavy Duty Portable Saw Horse Work Support Stands - 1 PAIR. DeWalt DCS331N XR Cordless Jigsaw Li-ion 18 Volt Bare Unit DCS331N-XJ + Tool Bag. SIGN UP TO OUR NEWSLETTER. Stay up to date with our special offers & promotions. 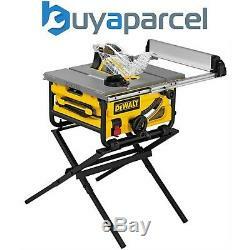 The item "Dewalt DW745 Heavy Duty Lightweight Table Saw with DE7450 Leg Stand 240v" is in sale since Tuesday, January 16, 2018. This item is in the category "Home, Furniture & DIY\DIY Tools & Workshop Equipment\Power Tools\Saws & Accessories\Table Saws". The seller is "buyaparcel-store" and is located in GB. This item can be shipped to United Kingdom.